This is a very busy weekend at our house! 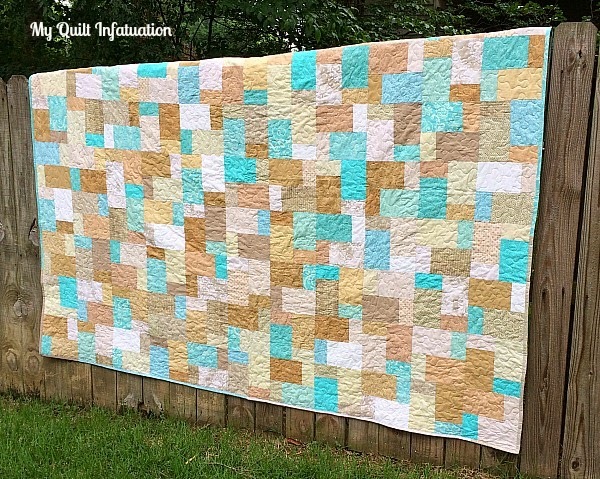 My birthday is today and our wild thing will be ten tomorrow, so with everything going on, I knew that I needed to go ahead and finish up this quilt and post about it! Oh, how I wish we lived closer to the ocean so that the photos could really show off this quilt. 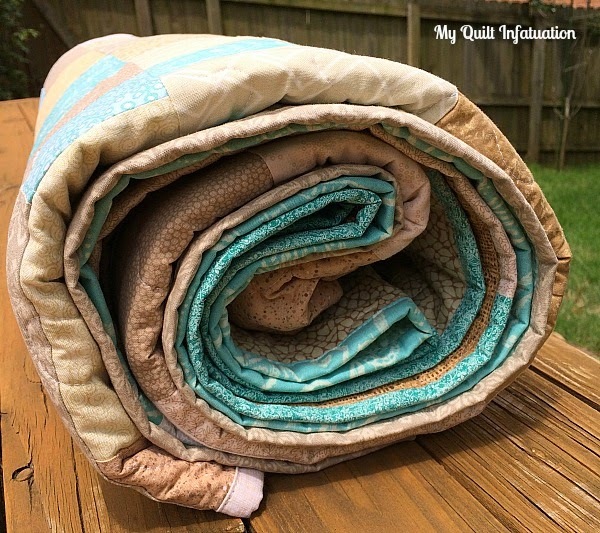 This quilt just belongs among the sand and crashing blue waves of the beach! Since Tennessee is decidedly inland, backyard photos will have to suffice. This quilt is a monster queen size- 80x100" and as quilts of that size go, it was a beast to get it quilted. Part of the issue is that most of the fabrics are so light in color that the quilting thread blends right into them. I ended up with two crossovers in my stippling, which I hate. Thankfully, the cause of them also makes those crossovers practically invisible. I do love the wide stripes on the backing. I think it's a great way to break up such a big quilt back, and makes it seem more manageable. One of my favorite parts of this quilt is the scrappy binding. I think it keeps the fabrics from getting framed in. The beach is such a beautiful and expansive sight, and I think the lack of framing keeps the quilt feeling like the beach. 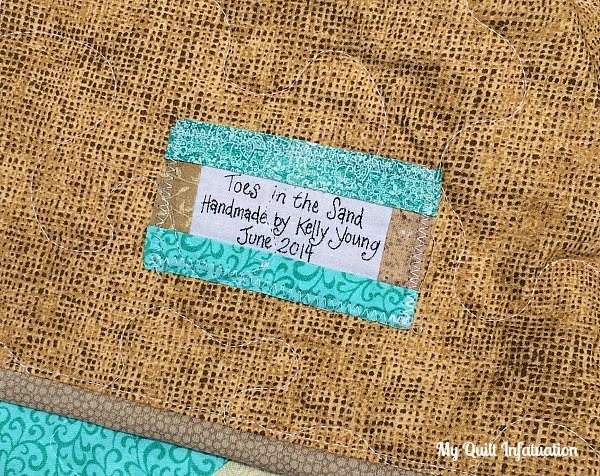 I decided to name this one Toes in the Sand, and although creating it wasn't without its challenges, it certainly makes me want to hit the beach and do just that! it is even more beautiful quilted. I hate cross overs too, but I'm learning to "let it go" and not worry about them so much. Another gorgeous finish! Those bigger ones are harder to tackle, but so worth the effort. Happy Birthday! My daughter (whose birthday was yesterday) lives in San Diego. She would love nothing better than to be back in Tennessee. But, you have managed to bring the beach to you in that quilt. Love the quilt and the colors. Love the quilt and the name does it justice. Thanks for sharing! Love it! Such great colors, really soothing. Happy Birthday! Happy Birthday! 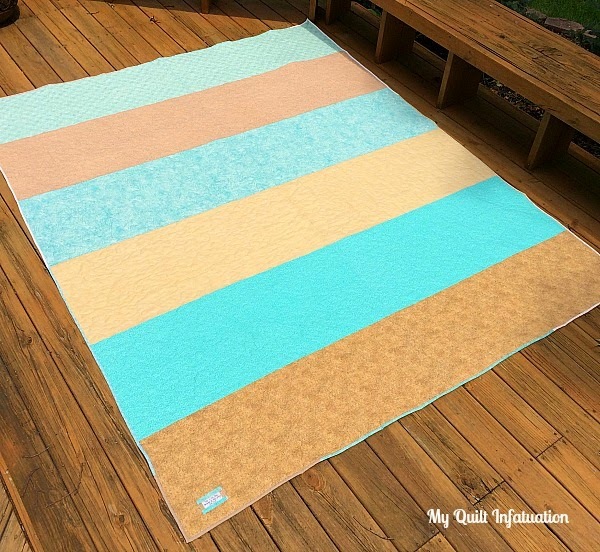 It's a beautiful quilt and definitely reminiscent of the beach! Gorgeous! It definitely screams for a day at the beach!! I think I like the back more than the front. So soothing. And happy birthday to you and your son. Happy Birthday! I hope you have wonderful and fun birthday plans. 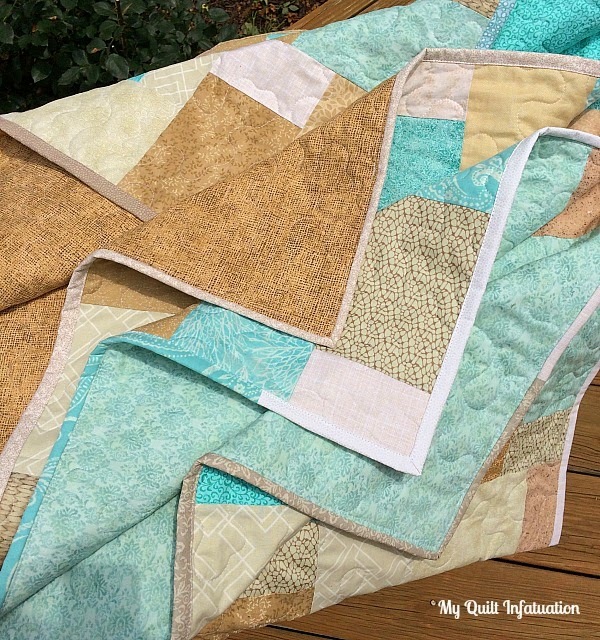 This quilt is so soothing and pretty. Love the colors. Happy birthday! Maybe you could find a lake with a beach, but I think your photos are fabulous the way they are. oh yes without reading bout this quilt I cab see sea and sand straight away, a lovely quilt. Happy Birthday Kelly! Hope you & your family are enjoying a festive weekend. You have such a knack for naming your Quilts! Lovely quilt, also a wonderful Birthday. Happy Birthday - now that your blogging is done - enjoy the rest of the day. Thanks for the posts on your beautiful quilt. Lovely finished quilt -- sure wish I could join you with your Toes in the Sand! Happy belated birthday. You are a year wiser, right?? As you know I just LOVE those colors together! Great new quilt you have made! Ì read this on sunday night, but I hope you had a great birthday! Happy birthday to you! Finishing a quilt is a great way to spend your special day! I just finished a huge queen quilt too! So hard to quilt, but did it! Love the back stripes! beautiful!